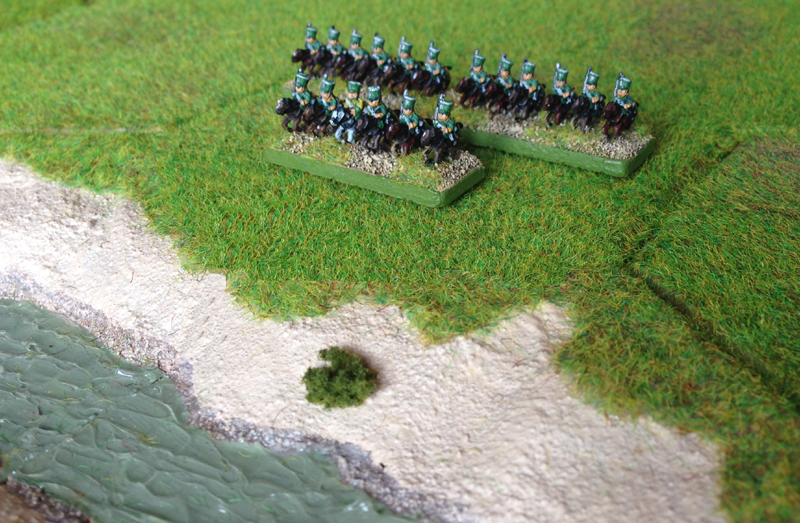 A quick guide to how I painted my 6mm 5th (Belgian) Light Dragoon Regiment for Waterloo using Baccus Dutch Belgian Light Cavalry (NDB8). Note that this pack contains officers wearing the French-style "stovepipe" shako and other ranks / trumpeters in the "bell-topped" shako. As such they can be used to represent the Belgian Light Cavalry regiments - 5th Light Dragoons and 8th Hussars. They cannot be used to represent the Dutch regiments - 4th Light Dragoons and 6th Hussars - as their officers used the "bell-topped" shako like the other ranks. Also I'm fairly sure that the 5th didn't have a sabretache, so we'll copy the one that the 8th had. Paint the jacket, trousers, shako and shabraque green. Apply the paint by drybrushing using a Citadel Medium Drybrush. Use a stiff paint mixture on the drybrush wiping off any extra on a cloth before use. Run the brush along the surface of the figures, leaving paint on the raised areas, but allowing the black undercoat to show through. It doesn't matter if you even cover other areas such as face, musket or knapsack. Facings: collar and cuffs. It doesn’t matter if you paint the collar too wide and cover part of the face. Paint the hair. It doesn’t matter if you paint the hair too wide and cover part of the shako. Face and hands. It doesn’t matter if you paint the face too wide and cover part of the shako. Piping round the shako and cross belt. Officers have silver epaulettes and silver piping round the shako. The trumpeter had reversed colours (yellow jacket with green facings).